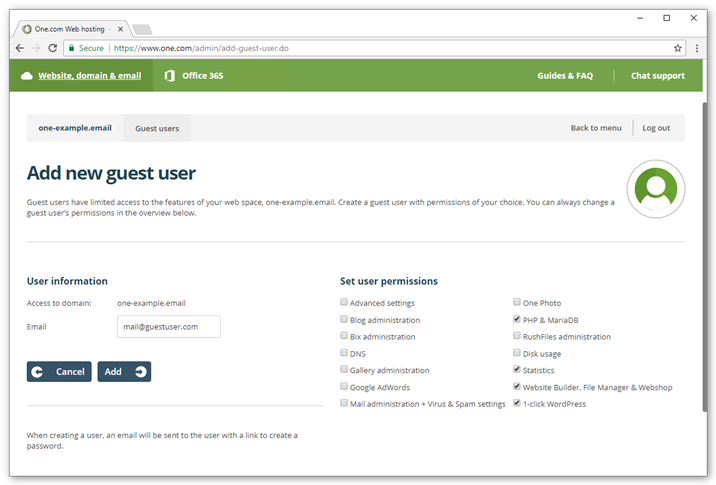 You can create guest users and give them access to selected functions in your Control Panel. This way you can give someone access to manage various features on the web space, without having to share your personal login. Log in to your control panel and click Guest users. Click Add new guest user. Enter the email address of the new user. This will be the email address used to log in. Set user permissions by checking the boxes. An email with a link to create a password will now be send to the guest user. Note: If there already exists a login with this email address, the guest user will not receive an email. The domain will simply be added to the existing login and become visible in the control panel.